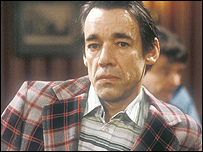 Only Fools and Horses star Roger Lloyd-Pack will play a villain in the new series of Doctor Who. Lloyd-Pack - who played Trigger in the classic BBC comedy - will appear in two episodes with Doctor Who's arch-enemies the Cybermen. The 61-year-old actor will play John Lumic, a human who becomes the Time Lord's opponent. 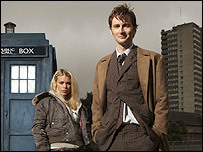 The series, to be screened on BBC One next spring, sees David Tennant take over the role of Doctor Who. Lloyd-Pack and Tennant recently worked together in the film Harry Potter and the Goblet of Fire, which is released next month. In the film, Lloyd-Pack plays magical ministry official Barty Crouch, while Tennant plays his son, Barty Crouch Jnr. Doctor Who proved to be a ratings success when it returned in March after a 16-year absence from television screens. The series won three prizes this week at the National TV awards, including most popular drama. Christopher Eccleston played the Time Lord with Billie Piper as his assistant Rose. The new 13-part series, including Lloyd-Pack's appearances in episodes five and six, will follow a Christmas special. The series will also see the Doctor and Rose meet Queen Victoria and an evil race of Cat Women. One episode will be written by comedian Stephen Fry, while The League of Gentleman star Mark Gatiss will once again contribute to the writing.